Do you know what Power Speedup 2018 is? Is your Windows operating system running slower than usual? Your first move might be to install Power Speedup 2018 or another application that claims to optimize system speeds and offer other benefits. Instead, you should scan your system using a legitimate malware scanner to check if the sudden slowdown was not caused by a malicious threat that requires removal. Even if malware is not the cause of the issue, you certainly should not invest your money into a program that cannot actually help you. Would you be entering a dangerous territory by installing this program? Most likely, you wouldn’t, unless more malicious programs were bundled along with it. That does not mean that you should install the program and then spend money on its services. While the installation is free, the PUP (potentially unwanted program) will not “repair” anything until you pay €23.95. Whether or not you have paid the price, we advise that you delete Power Speedup 2018. Has the scanner “inspected” your operating system already? If it has, you might be introduced to a number of allegedly harmful threats and registry issues that are slowing down your operating system. How trustworthy are these search results? According to our research team, the results are not fake, meaning that the Power Speedup 2018 scanner does not make up “threats” or issues just to send you into panic. However, the scanner does not actually find significant registry problems, and even empty registries can be introduced to you as serious issues. This is meant to push you into paying for the services of the PUP. Are you still thinking about paying the price? If you are, we suggest you save your money and invest it into something more beneficial; like an anti-malware program, for example. If you have paid for the services already, you can request your money back. In any case, our research team advises that you remove Power Speedup 2018 from your operating system at the end. Have you already determined whether or not you need to delete other threats? If you have found others, an anti-malware program can be extremely helpful because it can automatically find and erase all threats at once. This program can scan your system, eliminate all threats, potentially increase the productivity of the system, and also guarantee full-time protection. This is not your only option, of course. You can follow the instructions below too. Just keep in mind that if you choose to remove Power Speedup 2018 manually, you will need to clean your system from other threats and protect it in the future all on your own as well. Launch RUN by simultaneously tapping Win+R. Enter control panel into the field and click OK.
Move to Uninstall a program and then Uninstall the undesirable program. 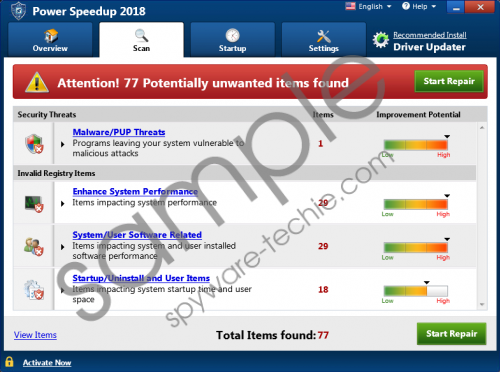 Power Speedup 2018 cannot add power or speed up your operating system because it is just another potentially unwanted program that poses as some amazing system optimizer. Although it does not show fake results, the program cannot scan the system thoroughly or find real issues that might be slowing down your operating system. If the PUP was free, we wouldn’t even pay attention to it. However, the services are not free, and if the user agrees to repair the threats and issues that are found, they have to pay money. Without a doubt, the services are not worthy of your savings, and that is why we have to warn you about this potentially unwanted program. It might be easiest to remove Power Speedup 2018 manually, but we advise employing an anti-malware program if you wish protection in the future and if you want all existing threats eliminated automatically. Tags: delete Power Speedup 2018, Power Speedup 2018, remove Power Speedup 2018.